NO ANNUAL FEES REQUIRED! - Enjoy golf's most reliable and accurate course maps from around the world, with no charges or fees for the life of the device. STYLISH AND FUNCTIONAL - The SkyCaddie GPS Watch's athletic styling offers a flexible, lightweight wrist band with locking buckle that keeps this watch from moving while you swing. Its ergonomic fit makes it extremely comfortable to wear all of the time. EASY TO READ - The Watch features big 1.05" diameter screen, easy to read front, center, and back of green distances that update as you walk or ride. TRACK YOUR MOVEMENTS - The SkyCaddie Watch odometer tracks your location, distance, time, laps, speed, pace and calories burned during a run, a walk or a bike ride. 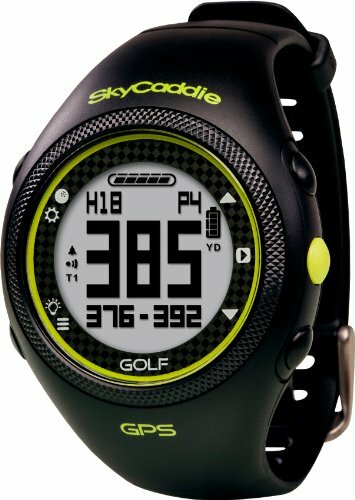 MULTIUSE - The SkyCaddie GPS Watch features digital scoring, backlight, alarm, stopwatch, measures any shot distance. It is durable and water resistant up to 30 meters. If you have any questions about this product by SkyCaddie, contact us by completing and submitting the form below. If you are looking for a specif part number, please include it with your message.